Who needs takeout when you can cook delicious Cashew Chicken at home? 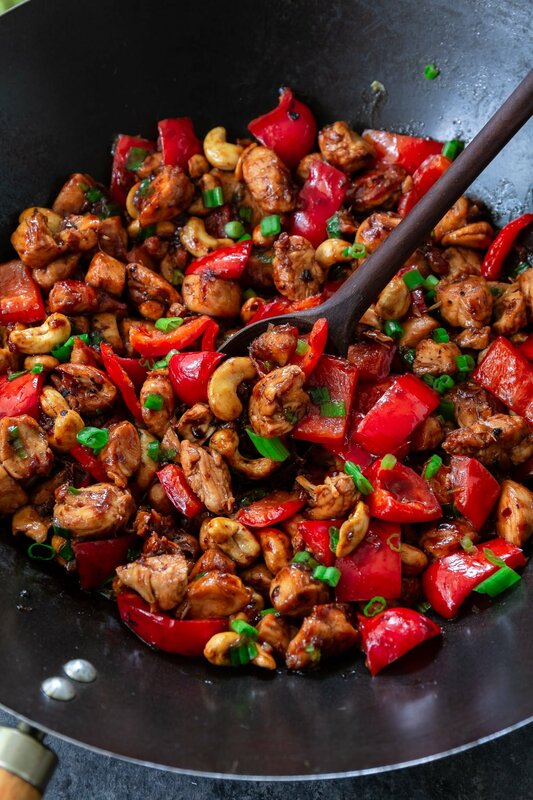 Tender chicken, scallions and peppers coated in a rich, sweet sauce and topped with crunchy cashews. I can’t get enough of it! 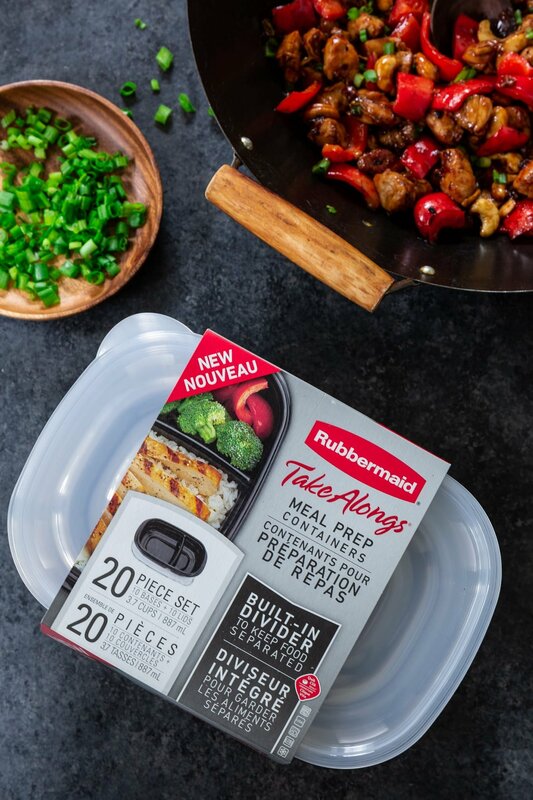 This post is sponsored by RUBBERMAID®, however, all thoughts and opinions expressed are my own. My to-do list seems to be growing faster than my ability to tackle it. I feel like I’m constantly trying to catch up with life and that’s so exhausting! Eating healthy is one of the things I struggle with when life is this busy. People assume that us, food bloggers, are always eating amazing gourmet meals. What you don’t see is us working all day developing and shooting a recipe to the point that we can’t stand to look at it anymore! So we end up going out to eat or having cereal for dinner. Glamorous, isn’t it? In an attempt to reduce my family’s fast food escapades, I’ve been trying to meal prep and I’m happy to report that it’s going pretty well. 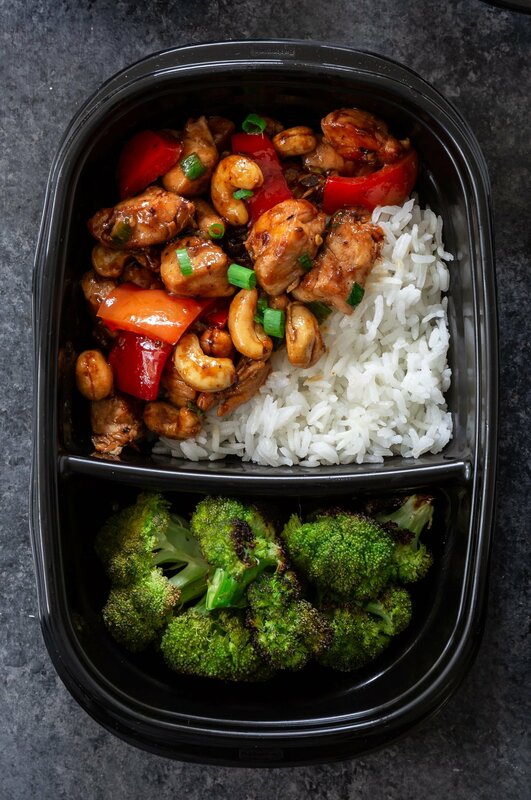 This Cashew Chicken is one of the recipes we love and it’s been on rotation since I made it the first time! It’s easy, fast and reheats well, making it a great meal prep dish. I’m a meal prep beginner – mostly because “chaos” seems to be my middle name – but I’m happy to share my journey and what has been working for me so far! And if you guys have any tips, please send them my way as I’m always looking to improve. Meal prepping can be different for everyone, as there are a lot of methods out there. But for the sake of this post, we are calling meal prepping the act of cooking meals ahead of time and individually portioning them for convenience. It can sound intimidating at first, especially if you are as disorganized as me. Do not fret, though! Even prepping one or two meals can make your life easier during the week. So do as much or as little as you want/can! I started doing only lunches, but now I add one or two nights worth of dinners too. It feels good to not panic when I hear my husband opening the front door, knowing I have a delicious meal waiting for him. Plus, homemade Cashew Chicken beats fast food any time, am I right? This is the easy part. Just sit down and choose all the meals that you want to eat on that week! If you love cooking and know that you can be in the kitchen for hours on a Sunday, go ahead and add those slow braised dishes that will nourish your soul. 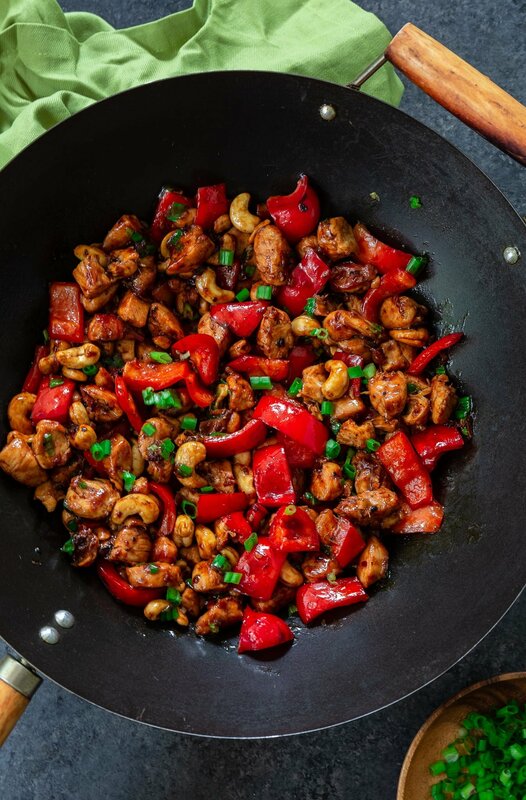 But if quick and easy is more like you, one pan dishes or fast stir frys, like this Cashew Chicken, are a great call! If you are just starting, I recommend you keep it simple though! Go for recipes you’ve cooked before and, as you find dishes that your family enjoys, put them on rotation. Choosing recipes that use common ingredients can also help you save time and money. A rotisserie chicken, for example, can be used for 2-3 recipes, depending on how many meals you are planning on getting out of it! Once you’ve written down your menu, list out all the ingredients you’ll need and go shopping. I like to buy my groceries the day I plan on cooking, which is usually Sunday, so everything stays as fresh as possible. Also, organizing your grocery list by department is always a good call! Nowadays, there are apps that can do that for you. Oh, how I love technology! What do I need to start meal prepping? Other than a meal plan, time to cook and groceries, you will need containers. I use TakeAlongs® Meal Prep Containers that I buy at Walmart! They can hold quite a bit of food (3.7 cups), are microwave and dishwasher safe, BPA-free, and have Quik Clik Seal lids to ensure food is securely stored. I love that they are stackable, as cabinet storage is always an issue at my kitchen, and great for on-the-go. You also get 20 pieces in one pack, for less than 10 bucks! Oh, and the built-in divider is great for side dishes or dessert. Now that you’re all set with everything you need, it’s time to have fun! Don’t let meal prepping overwhelm you and become a boring chore. So go ahead! Start with a recipe you love – maybe this Cashew Chicken? – and build it from there! Having delicious meals waiting for you after a busy day at work will make it all worth it, I promise. Season the chicken pieces with salt and pepper. Heat the vegetable oil in a large skillet, over medium high heat, until very hot. Working in batches, add the chicken and stir fry until golden brown, about 4-5 minutes. Transfer the chicken to a plate and reserve. Add the bell peppers and garlic, and cook until crisp-tender, about 3 minutes. While the veggies are cooking, make the sauce. In a bowl, mix the hoisin sauce, soy sauce rice vinegar, honey, grated ginger, red pepper flakes, sesame oil, water and corn starch until well combined. Reserve. When the veggies are crisp-tender, add the chicken back into the pan and pour the reserved sauce over the chicken and veggies, tossing so everything is coated. Cook for a couple of minutes, until the sauce thickens. Add the cashews and scallions and stir to combine. 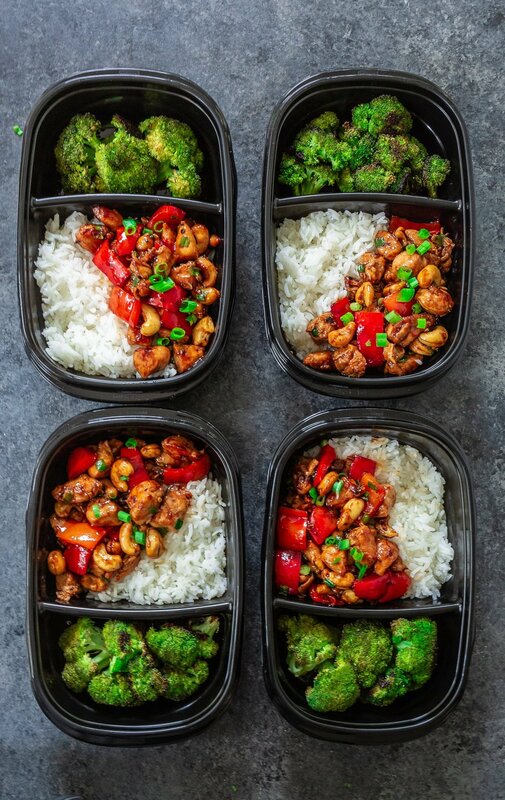 Serve immediately or, if meal prepping, divide into 6 to 8 containers. It will keep in the fridge for 3-4 days. Sou uma brasileira (claro!? ), quase médica e amante de cozinha! Achei seu blog por acaso navegando por sites e receitas e estou simplesmente apaixonada! Já compartilhei com a minha mãe, tia e até meu namorado, que são os meus parceiros na aventura culinária! Queria deixar aqui o meu agradecimento por proporcionar a todos um blog tão delicioso! Não só as imagens e receitas são de dar água na boca, mas também sua forma de escrever torta tudo mais envolvente e incrível! Saiba que tem uma fã e leitora voraz no seu país de origem!